What Is Health: What's In A McNugget? 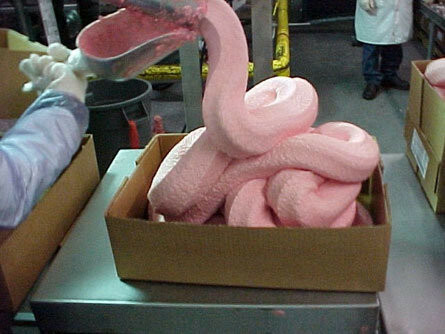 McNuggets before the breading and frying. Weight Watchers recent announcement endorsing McDonald’s Chicken McNuggets as an appropriate meal selection for individuals striving to lose weight has sent the health and fitness industry into an uproar. Any organization that strives to create a better quality of life through weight loss for their members will ultimately be leading them down a path of health disaster if they continue to give the okay to fast foods and their health deteriorating additives. When consumers choose to make their own chicken nuggets at home, they get fresh chicken, cut it up into chunks, bread it and either bake it or pan fry them. When searching McDonald’s website for ingredient lists for all of their menu options, the McNugget is only 45% farm raised, hormone injected chicken. That leaves 55% of the remaining nugget comprised of chemicals; 37 to be exact. One of the 37 ingredients in the McNugget is dimethylpolysiloxane. This anti-foaming agent is used in silicon, caulk, silicone breast implants, cosmetics, and Silly Putty. When inspecting a McNugget, this chemical is what gives the “chicken” the whipped texture. Another dangerous chemical contained in the McNugget is tertiary butyl hydroquinone. This chemical is petroleum based and is found in perfumes, varnish, resins, and oil field chemicals. Recent health studies show that this chemical highly carcinogenic and is known to cause stomach tumours as well as damage DNA. If you still are not convinced of the dangers that McNuggets or other foods offered on McDonald’s menu can cause to health, rent the documentary Super Size Me. This movie is a scientific experiment that depicts what can happen to the human body overtime when eating frequent fast food meals. Before the 8 week study could conclude, the participant developed fatty liver disease, his blood pressure sky rocketed, and his doctor highly suggested stopping the experiment for fear of future ramifications, possibly irreversible, to the participant’s health. If Weight Watchers was truly concerned for their participants and their health, they would begin to focus on educating all participants on smart ways to lose weight that include less fast foods, more fruits, vegetables, and lean proteins and incorporate daily exercise.